The spider clip is fitted on to the wall tie against the inner leaf and this creates the minimum cavity between the product and the blockwork. 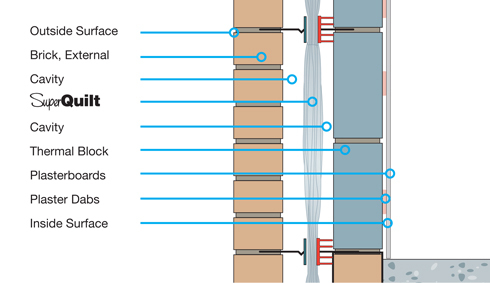 The initial run of SuperQuilt is positioned over the wall ties, ensuring that it is kept taut but with sufficient drop to below floor insulation. SuperQuilt can be cut with a sharp blade to fit onto wall ties. The top edge of the material should be a minimum of 75mm over the top row of the wall ties giving a weathered lap joint. When a full run is in position, the retaining clip is fixed to the wall tie to keep the SuperQuilt central to the cavity. The second leaf is built up to the topmost line of the wall ties, (or two courses below) and the second run of SuperQuilt installed ensuring a minimum lap of 75mm. Vertical joints in the SuperQuilt should always be on a line of wall ties, ensuring a 100mm lap (ie 50mm either side of the wall tie) and sealed using YBS Foil Tape. At internal and external corners a recommended air space of 25mm must be maintained.